Dr Legendre was conferred a PhD in Plant Biochemistry in 1993 for his pioneering works on the plant oxidative burst, plant secondary metabolites and plant signal transduction processes. 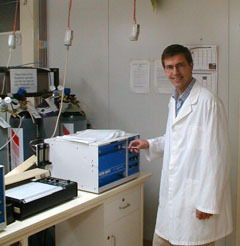 He pursued his study of plant signal transduction elements during his post-doctorate before being appointed as a Lecturer at the University of Reims (France) in 1994. He has then briefly studied grapevine freezing resistance mechanisms before concentrating on the discovery and characterisation of grape defence proteins (PR-proteins) involved in the natural resistance of grapes to grey mould symptom caused by the fungus Botrytis cinerea. Dr Legendre has published close to 20 manuscripts in internationally refereed journals and has trained 3 PhD students and 18 honours students. For his accomplishment in the field of Botrytis research, Dr Legendre has been one of the organisers of the last International Symposium on Botrytis. Areas of Interest: Disease resistance of fruits to fungal pathogens via the development of non-toxic fungicides, naturally tolerant crop plants or better cultivation practices; Water stress; Grapevine; Grey mould (Botrytis cinerea); Evolutionary processes in plants; Proteomics. Current Research: Regulation of fruit natural defences during ripening, fungal infection and water stress; Regulation of fungal pathogen virulence by fruit substances; Carnivorous plants phylogeny; Fungicide resistance in Botrytis .